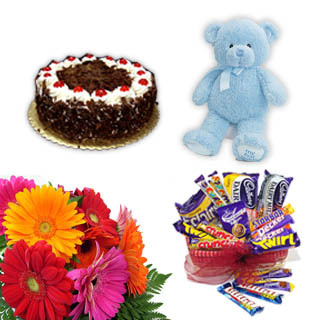 Send this beautiful hamper to your near and dear ones to convey your special wishes on any occasion.This consists of delicious cake and 6" teddy bear 12 mixed gerberas bouquet with 20 Cadbaurys chocolates (each 12 gms). please specify flavour of the cake.Always with You is our special creation for the special people in your life. It comprises of a beautiful bright combination of yellow roses, gerberas and lilies arranged artistically in a basket by our professional florist. 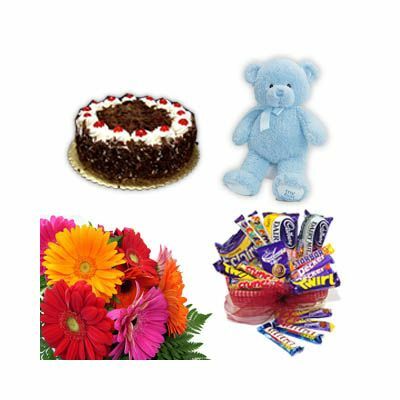 This sunny flower basket comes with 20 irresistible Cadbury’s Chocolates and a cake of the flavor of your choice. (You can choose from Vanilla, Pineapple, Chocolate, Butterscotch and Strawberry). Send flowers online and make anyone’s ordinary day special. This lively gift hamper can be sent on baby showers, to friends and colleagues, on birthdays, weddings, graduation and other happy occasions.